From The Beatles to Eagles to Models, bands with two lead singers have been around pretty much as long as there have been bands. And with two vocalists comes double the chance of solo careers - but sometimes it's not always the singer you expect that has a big hit on the side. This week in 1986, one of the singers from one of the most popular bands in Australia debuted on the ARIA top 50 with his first solo single. The cover version shot up the singles chart and ended up peaking at number 2, the same position reached by his band's biggest hit. The biggest hit in Australia this week in 1986 was "That's What Friends Are For", which dethroned "A Good Heart". Dionne Warwick and friends would only last a single week at number 1, with the next chart-topper racing into the top 10. First up, a nice bit of Australian synthpop from the Sydney duo comprised of singer Cat Critch and keyboardist Phil Colville. Never heard this before, but I quite like it. A third and final top 100 appearance for the Australian pop/rock group whose Locked In A Dance album came out in 1986. Beating her band-mates to the punch, Jane Wiedlin became the first ex-Go-Go to release a solo single, although this wasn't as well received as Belinda Carlisle's debut later in the year. A couple of weeks back, we saw "Sounds Of Then" by GANGgajang peak much lower than you would've expected a classic song like that to have done. At least that made the chart. Here's another band with a now iconic track that was never a hit. Taken from Violent Femmes' debut self-titled album, 1983's "Blister In The Sun" is a bona fide classic, but since it wasn't released as a single until 1997, it never featured on the ARIA top 100. And so, it wasn't until their cover of T. Rex's "Children Of The Revolution" that the Femmes made their first appearance on the Australian singles chart. The lead single from third album The Blind Leading The Naked, "Children..." peaked 41 places lower than the original and would end up as the band's highest charting single. This track may as well have been credited to Nick Lowe & The News, since not only did Huey Lewis's backing band play on this version of the much-covered song, but it was produced by Huey himself. Nick had actually written the song way back in the 1970s, with Dave Edmunds the first artist to record it, his version reaching number 32 in Australia in 1978. After some notable live performances and recordings of the track by Nick himself since then, he finally included the song on a studio album, 1985's The Rose Of England. 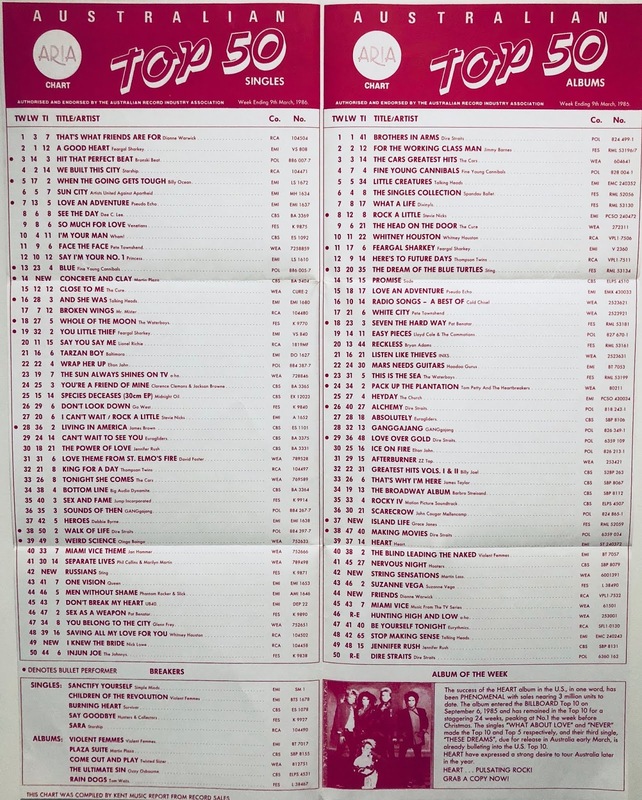 The single release of "I Knew The Bridge..." returned Nick to the Australian top 50 for the first time since "Cruel To Be Kind" (number 12 in 1979). In 1987, comedian Kevin "Bloody" Wilson reinterpreted the song as "I Knew The Bride (When She Used To Be A Moll)" on his Born Again Piss Tank album. Just when it looked like interest in Sting's debut solo album, The Dream Of The Blue Turtles, had petered out, fourth single "Russians" turned things around in a big way. The overtly political track eclipsed all three previous singles to peak just outside the top 10 and, in turn, helped push the album back up the chart to enjoy a three-week run at number 1 in April/May. I understand why "Russians" received a lot of attention - it made a bold statement, name-checking both US president Ronald Reagan and USSR premier Nikita Krushchev in its condemnation of the Cold War. But for me, the song, which incorporates a melody by Russian composer Prokofiev, was my least favourite of Sting's singles up until that point - too dark, too dour. Blame it on "Live It Up". 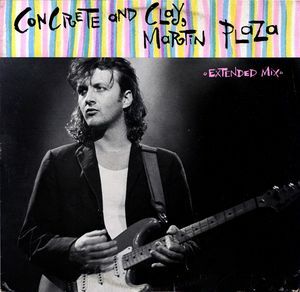 Thanks to Mental As Anything's biggest hit single, I considered Greedy Smith to be the band's main lead singer and Martin Plaza to be the guy who occasionally got to have a go. But, that wasn't actually the case. Martin provided vocals for (and wrote) many of the band's best known songs, including "If You Leave Me, Can I Come Too?" and "The Nips Are Getting Bigger". So at the time I was a little surprised when it was Martin - and not Greedy - who found himself with a solo smash hit on his hands in 1986. Originally released in 1965 by Unit 4 + 2, "Concrete And Clay" had been a number 21 hit in Australia. Martin's fairly faithful version spent three weeks at number 2, stuck behind Billy Ocean's "When The Going Gets Tough, The Tough Get Going". Unfortunately for Martin, the chart success wasn't a sign of things to come, with "Concrete And Clay" winding up as his only top 50 appearance. Next week: one of the world's most popular actors tries his hand at a pop music career - and it wasn't awful. Plus, a song that flopped the first time round returns and finally turns its performer into a major chart force. What does Nick Lowes "I knew the Bridge..." sound like? The Clash 'I Fought the Law'. Seems like around this time for the past few weeks a good heart, that's what friends are for & we built this city were the main dominators at the top of the charts. Looking at the underated song I'm your man was pretty underlucky to stay at 3 for 5 weeks as it's probably whams best hit & deserved at least a week on top of the charts. I only heard the song played once recently on air & that was by a Sydney community station. Most of the mainstream radio stations like wsfm, smooth just play the same songs over & over with at times a lack of variety. Anyway thanks again for the charts Gavin! I never knew Jane Wiedlin had any solo pre-'Rush Hour' stuff. Nice song. I'm surprised 'Gone Daddy Gone' by Violent Femmes didn't chart here. 'Russians' would be my favourite solo Sting song. I associate it with the Chernobyl disaster, too... the timing for its charting here couldn't have been 'better' in that regard. I never knew the instrumental melody was borrowed from something else. 'Concrete and Clay' sounds like it could have been an Elvis song to me, for some reason. I think I remember seeing the video on 'C'mon Kids'. 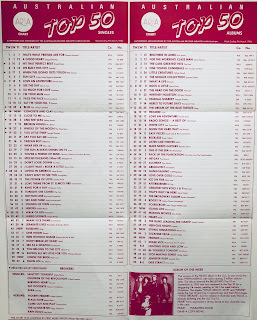 Martin Plaza did have another Top 40 hit with James Freud in 1991...as dance/pop outfit Beatfish... "Wheels of Love". Yes, sorry, I was talking about appearances as a solo artist - but that could've been made clearer. He obviously had plenty more hits with Mental As Anything after this, too. We'll be coming to Wheels Of Love later in the year in my 25 Years Ago... posts.